When oxygen from the air is subjected to a high energy pulse the usually diatomic molecules break down into single atoms and recombine. Some of these recombined molecules contain three oxygen atoms instead of two. This new compound is called Ozone. Because of the crowding in the molecule and the dispersion of the electronic charge, ozone is less stable and reacts rapidly with oxidable substances. Ozone, which is produced in nature, acts in the environment to keep in check natural pollutants which would otherwise overrun the earth and make it uninhabitable. Areas of high pollution such as cities are missing the naturally made Ozone because it is being used up by all the oxidable substances being spewed into the air from cars and factories. When you take a trip to the countryside, and sit down by a mountain stream, you can breathe the refreshing air because the natural ozone has been in a surplus and has had an opportunity to remove the oxidable materials. New buildings are built with vapor barriers, and a high degree of insulation such that there is no longer the natural exchange of air between the outside and the inside. Meanwhile more and more of our furnishings and floor coverings are made from synthetic materials. Under the stagnant air conditions which prevail because of the lack of ventilation, decomposition products and solvents leach out of these synthetic materials and fill the indoor space. Much has been said about the sick building syndrome and this usually refers to institutional buildings. But they have basically the same problems as the private home. People exposed to such conditions suffer from symptoms of environmental toxicity. Health effects may show immediately or years after exposure to bad indoor air. Immediate effects include irritation of the eyes, nose and throat, sinus congestion, headaches, fever, shortness of breath, dizziness, nausea, anxiety, allergic reactions, sneezing, dry cough and fatigue. Effects of long term exposure include: emphysema, asthma and other respiratory diseases, hypersensitivity, allergic rhinitis, carbon monoxide poisoning, influenza, pneumonia, humidifier fever, heart disease and cancer. All of these troubling chemicals have one thing in common they are oxidable. When inhaled, they increase the demand for oxygen in the human body and thus deplete the body of oxygen. Most pathogens causing illness, such as bacteria, viruses, cancer, and fungi, are anaerobic. As a result these pathogens can thrive only where oxygen levels are depleted. This explains why it is so important for people to breath fresh air. Oxygen in its restructured form known as Ozone is about 3,500 x more potent as an oxidant than normal oxygen. Thus even in small and harmless levels it kills all of the anaerobic pathogens mentioned above. It also oxidizes all harmful pollutants into much less harmful or completely harmless compounds. For example: Carbon Monoxide (CO) is perhaps the most dangerous gas known. It has no smell and it bonds to human blood about 600 x faster than oxygen. It is a real killer. Ozone adds one oxygen to the molecule, turning CO to CO2 which is carbon dioxide ? a harmless gas which we discharge with each breath in large quantities. CO2 cannot be further oxidized. Plants breath CO2 in the daylight, utilizing the carbon in the molecule to build their bodies while discharging oxygen back for people to breath. It is high levels of oxygen which make air fresh, along with low but measurable levels of ozone, very little dust, and no oxidable chemicals. After a lightning storm, rain washes down the dust, lightning produces ozone thus removing all oxidable gasses and killing the pathogens. The result It feels so good to take a deep breath. Lightning storms are more frequent in mountains where during sunny days UV radiation from the sun also combines a small portion of oxygen into ozone. For centuries people in Europe sick with Tuberculosis and other severe illnesses have been sent to special, high mountain resorts ? often with excellent results. Ozone is a disinfectant. Did you notice that flu season comes with the rainy season in the Autumn? This time of year brings in cloud cover which limits UV radiation and therefore reduces the natural production of ozone. As a result, airborne bacteria and viruses get around much easier. When there is a surplus of Ozone in the air, it will kill all bacteria, viruses and mould. Ozone in natural settings is around 0.02 ppm, but it can be as high as 0.10 ppm. At this level it is capable of keeping pathogens in check and yet is not harmful to higher life forms such as fish, birds, animals or man. Ozone does not cause harm to the environment ? contrary to some irresponsible statements. Only a prolonged exposure to very unnatural high levels of ozone may lead to discomfort, later headache and coughing. Such symptoms tell you to leave the space and seek better air ? leaving without permanent damage. Too much of any good thing is harmful. Even healthy food or drink can harm you if taken excessively. Not one case however has ever been recorded of a human death associated to ozone. So why does nature alert us in the case of over-exposure to very high levels of ozone? When too much of ozone is inhaled, some of it breaks down partially and it may combine into small amounts of so-called free radicals. These are known to cause damage to human cells which can be described as premature aging. But the body knows, and has its defense in antioxidants. A typical antioxidant is Vitamin C, E, Carotene along with many other natural elements found in our daily food. Unfortunately, most foods are now so processed and refined that many useful elements such as minerals, and vitamins are stripped away. People have also treated their water supply with chlorine, a toxic chemical used in war to kill people. Only Ozone is able to reverse some of the harm caused by chlorine by breaking down these harmful substances, even inside the human body. Antioxidants in general keep blood a bit more acidic and ozone is known to be more stable (thus not forming free radicals so easily) in more acidic solutions. Over 4000 scientific papers have been written about the health benefits of ozone. Ozone can be produced in its cleanest form by a process simulating natural lighting in devices called Corona Discharge Ozone Generators. First patented in 1895, ozone generators have been substantially improved over the years. AZCO INDUSTRIES LIMITED, has for decades been on the frontiers of this development. Copied by many, yet always staying a few steps ahead. Today AZCO produces a whole product line suitable for air treatment, water treatment, wastewater treatment along with a variety of other applications. In the home, ozone can be used to oxidize many disagreeable odors, such as: solvents from fresh paint, cooking odors, cigarette smoke, animal odors, litter box odors, garbage, mildew, glue smell from new furniture, and all other smells of organic or inorganic origin. There is virtually no smell that ozone cannot treat. Ozone oxidizes harmful elements before they can enter your body and seek oxygen from your body. Deodorants mask odors by making more odors. In this manner they behave very much like using a loud radio to cover up the cry of a child, or a using a flash light against your eye to hide what you are not suppose to see. Ozone however actually reacts and oxidizes odors into harmless compounds. Ozone is unique ? ozone can do it. In light of ozone?s many benefits, we can now describe how an AZCOZON ozone generator can be implemented for air treatment in homes or other smaller buildings. Government regulations for ozone levels vary. In Europe, based on decades of scientific studies ? continuous exposure to ozone is allowed to a maximum of 0.15 ppm. In Canada the limits were arbitrarily lowered to 0.10 ppm. When the U.S. government looked at the Canadian levels, it decided that 0.08 ppm was going to be the U.S. limit. As a result, mountain hikes may now be illegal for you since the natural levels of ozone may exceed the government standards. Fortunately, it is not necessary to maintain ozone levels in the home anywhere close to the above limits. When the ozone level is close to the limit levels it smells so strong and it can hardly remain unnoticed. Ozone can be noticed at much lower levels, even below 0.01 ppm. If we release ozone into a smelly room, for some time there will be no ozone residual left at all ? as all ozone will be consumed in oxidizing the odors. Only after the job is completed will some ozone residual start to appear. Even at the lowest levels, ozone already kills any bacteria present. This makes the configuration of the ozone output from our ozone generators an easy task. These units come with an optional internal air pump, a 10-position switch, and in both a 12V DC and a 120V AC version. Hundreds of them are in use for car deodorization in repair shops, while others are used in paint shops and for air treatment after house paintings. The HTU500 is also implemented in agriculture storage facilities for mold suppression, in chicken and other farm barns, and for many other odor intensive operations. In all of these cases the ozone generator must be installed outside the treated room, and nobody is allowed inside since the ozone levels may exceed the human long-term exposure limits during treatment. Much larger ozone units are available to treat large office buildings and industrial operations. 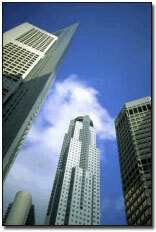 In office buildings the ozone system is a part of the central A/C system. Since the ozone level cannot be controlled properly for all rooms, ozone serves to disinfect the air returned to the A/C system. The ozone-treated air is then passed through a carbon filter and residual ozone is removed before entering the air duct distribution system. The purpose is here is to supply clean fresh air. Only when the building is empty, the carbon filter may be by-passed and ozone allowed to remove slime and other bacterial deposits from the air ducts and the offices.